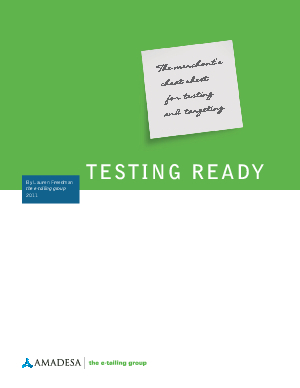 In this whitepaper we share what we learned about testing, such as what types of tools are commonly employed, the benefits achieved through testing and what resources are required to support a testing program. Additionally, we share the 7 Secrets To Successful Testing, compiled by advice from industry peers regarding testing smart. In the end, it is clear that testing should be a mandatory e-tailer marketing strategy, as one rarely finds a tool that effectively impacts both user experience and conversion, providing additional fodder from a “value” perspective. Download now to learn the proper steps to getting started, building a culture that supports testing, and ensuring a successful path to increasing conversions and improving marketing ROI.